The first album is simply called Djabe. 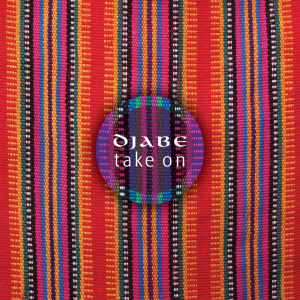 Like many bands over the world, Djabe also thinks of it’s first album as a kind of early age green, but recognize the fandom’s generally positive attitude towards it. The attitude possibly comes from the collage of thriving, and parts of experimental sounding and envisioning that bloomed in the next 20 years, gaining clarity. Here, everything is refreshingly raw, almost unkempt but none at all near chaotic. The introduction states “Djabe consists of Novus Jam members and friends”. 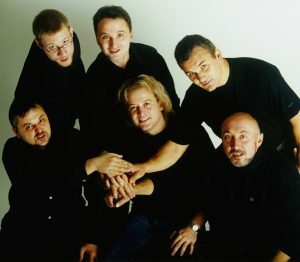 Besides the founders András Sipos, Attila Égerházi, Tamás Barabás, Ferenc Muck quartet we have, from the previous band, Judit Gesztelyi Nagy, Tibor Karvaly and Tamás Rácz. Foretelling the future, we also have Ferenc Kovács and his trademark trumpet and violin plays. The album was mostly composed by Attila, with either Sipi or Tibi Karaly as a sidekick in creation. Other Novus Jam musicians and guests were only ad hoc contributors. Djabe was not even the name of the band but just of the albums. 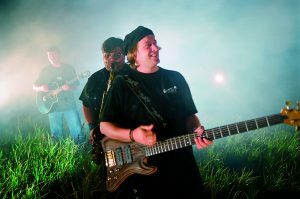 In 1997, after the release of the album invitations for gigs were pouring in, and arose a want for creating new compositions. Attila and Sipi decided to create a solid band with stable line-up, to present the premiere of the album. This request was answered by the already contributed Tamás and Mucki. Feri Kovács was otherwise engaged and Tibor was too pre-occupied by his everyday work. This is the story of the duo of Djabe becoming a quartet, in 1997. 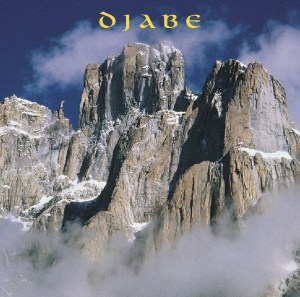 I also regard the first Djabe album as a personal favorite. Even it’s cover, featuring white mountains, the photos and drawings of the booklet, the uncanny dome of the Roman Pantheon covered by the disc itself, does it for me. The music, especially with today’s Djabe-tuned ears, is like peaking into a master’s notebook of early works, with drafts and finished or quasi-finished masterpieces. Of course this is not a judgement on quality, a draft can be perfect on its own, like the opening Camel Run, a duet of Mucki and Sipi, the Chase, a bass-conga rush across the savannah by Tomi and Sipi, the tender waves of Attila in Venezia, or the Late Night Drink, with its abundance of guitar akin to Jimi Hendrix-earlies. We hear the Djabe-hymn the first time, for which, 2 years later the well-known clip on the coach concluded, with Mucki as driver and Sipi as ticket inspector, and a colorful women’s ballet. Hungarian-born director László Nagy, now living and working in the States, said: “Who could forget the moment Feri Muck taking the driving wheel of an Ikarus 66 for the first (and possibly last) time in his life, and even reached for his saxophone to play for the camera. Or when Sipi tried to solve the dilemma of opening a door while carrying a large flat screen, with success”. László later directed the short film ‘Coffee Break’ for Djabe. In Passage the faithful angklung keeps clanking. The four-movement opus of Leaving The Desert is a real pearl for a chamber for music with meditative guitars, thick solos of violin and saxophone and with its main theme, later recurring. Like Wainting For The Distant Dance, a piece that, after multiple reconstitutions, is a permanent element of gigs for 2 decades. A photo stands as proof the four boys crossed that famous northwest-London crossing, like everybody does if walking there, but looking it more closely its actually Atti, times four. And the arabesque, Native American-design disc was released on LP and MC formats too. A year later, a VHS titled Witchi Tai To Tour came out, featuring the 1998 November gig at PeCsa, swimming in Vari*Lite lights, surrounded by Gábor Bakó’s ring of dancers. On the album’s 15th birthday Tomi did a complete remixing from the original multitrack. He improved the sounding of the music, hence the three-dimensional feeling of the surround 5.1 version – and of course the high-grade fidelity of the acoustic instruments: even the tiniest detail, smudged on generic stereo, now comes forward. More add-ons were the live video record of the original gig from 1997, and the clip of Djabe and Coffee Break. 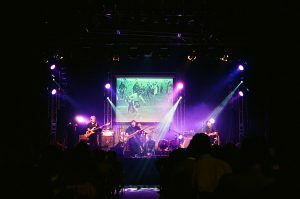 But this is still not the final destination: in 2015 the band released a 2CD + 2DVD historic release of Witchi Tai To, with interviews, 3 hours of live video recordings in an LP-size artbook. How these pieces of a milestone were born? Atti will guide us through the story. I heard a few sentences at one of my archive-days, when he was dictating, the whole story to one of his employees in the office, carefully rephrasing every bit again and again. I heard that the opening Coffee Break, Muki’s most known composition, with Ferenc Snétberger manning the guitar, was thought to be a hit by the band; and actually, they were right, as its remix was often played at many radio stations, and even made it to the Juventus Radio remix-CD. Ode was pretty well known already from the second Novus Jam and first Djabe album – on the former it was under the alias Northern Adventure. The original was written by Atti, in 1994, under the influence of solo albums by David Gilmour (for me, Weather Report came to mind when listened to the main theme middle part). The Island enclosed light reflecting off the sea, photographed by Attila, and made into the piece Island (in the Novus Jam era), would be quite perfect for me, too. 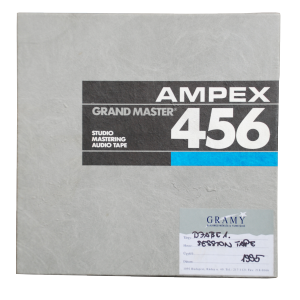 „In the early 90s I mostly recorded my improvisations on cassette or reel-to-reel tape. Often, I found myself going through these recordings and editing them into real pieces. This is how Odyssey came to be, a simple but clean melody, at least for me. We added Sipi’s clay drum and a fretless bass guitar, and finally, Tomi made it whole. I somehow thought about sirens, these legendary sea born creatures, when listening to it; so, we asked Judit Herczeg, Tomi’s wife, to add some vocal to strengthen this siren’s song.” – said Attila. The scenery after a refreshing rain, with sparky and obscure lights and odors, all try to send the sensitives to a kind of alpha phase. Visions After The Rain is the most „world music-like” piece on the originally made-to-order series Visions. But nobody can stop me at Early Morning Show; for me, it is the twin to Late Night Drink of the first album but made more serene by acoustic instruments. At the next ’vision’ called Cocktail Sipi’s vocal and Tomi’s bass guitar both break free. If a musical composition has depth and meaning it can withstand numerous versions, rearrangement or splitting. A fine example for this is Desert, having a main role early as the album Djabe. The four themes became three, and the second gives the first opportunity for a bass solo for Tomi – a first, but not last occasion. The movement of homecoming is a returning theme for the band: here, it takes the shape of a festivity of drum and vocal. If there is a real African piece on the disc, it must be Visions, a composition built upon the original corporate-dance gig. The piece shows how inevitable are the masters. We can see the dance choreographed for it, at the beginning of the recording from 1997. „I listened to the music, made by a completely different state of mind from the generic ad-type jingles and pieces. 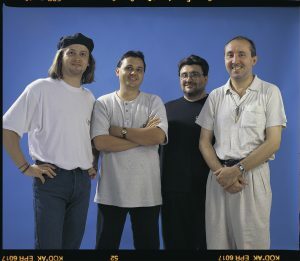 It does not want to bathe in quick and volatile success, but starts slow, builds up continuously, sometimes even repetitively, then a theme explodes and runs along with us, into an unknown world – in one word, it’s interesting.” – said Gábor Bakó, who met with Sipi and Atti in the Novus Jam era. Sipi’s vocal, kalimba and djembe brings back some antediluvian simplicity – this was the other piece, besides Djabe, that was laid to rest together with Sipi, because „without him, there’s no point in playing it”. Roots of Gallop stretch back to Novus Jam also, as it was the joint composition of Atti and Judit. „A piece undefinable by genre – a statement that became true for numerous Djabe compositions in the future. It’s Djabe, period.” – said by many. In its dynamics, provided by Atti and Muki, and a guitar creating a western-like atmosphere, not even far from free style. And for contrast, the saxophone-orientated Last Vision. 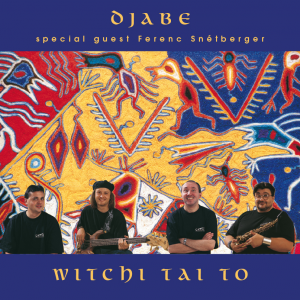 The idea came true, as this release is one of the most popular of Djabe’s discography, and until Sipi’s death the last piece featured heavily on gigs. And Witchi Tai To was the last to be played by Sipi, on his last performance in Debrecen, on the 7th of December 2007. Did he know this is his farewell? Either way, it was worthy of him. In an Interview for Student E, András Sipos said this about Witchi Tai To and his definition of world music: „Pro musicians often say world music is mostly amateurish, as so many play it who knows absolutely nothing about the language of music as a profession. However, its also clear that the better musician you are, the further you can fly away, because all heights have deep roots. If someone has a good enough relation with the chosen instrument then surely, that musician can let go long enough to breed something special, a musical experience to last. 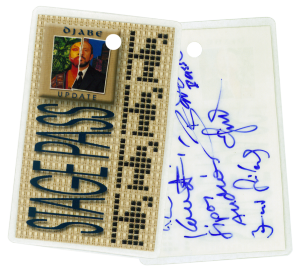 We are accustomed to Djabe sharing its archive treasures with fans, or we can say they place their creations into historic scenery. And it is the same here, too. We even invited to the studio to witness the birth of a piece. Besides the original recordings we can listen and watch some portions of old gigs. 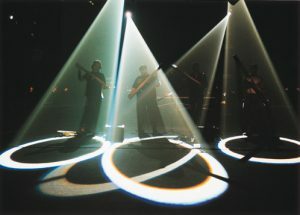 As seen in the film of the 1998 tour, with Witchi Tai To, Djabe perfected the nexus of music, stage lighting (Vari*Lite) and choreography. And some more historic documentation of importance; radio and tv interviews by the band, especially some musical show led by András Sipos, mostly angklung. „The sounding changes year by year, but this album never seemed outdated.” – said Tamás Barabás, who remixed Witchi Tai To, in an interview about the secrets of studio recording. „The 4 disc deluxe media book version of Witchi Tai To will definitely become the paramount Hungarian release of 2015, raising the bar for future retrospective compilations. It’s self punishment not to buy this top-quality re-release of a Djabe masterpiece.” – said Jozé, a critic for Ellensúly. 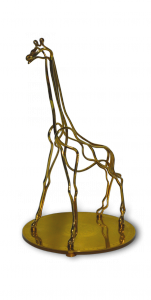 It cannot be argued that the Hungarian Music Award for World Music of 2000 made into the best possible hands. In a genre only partially known by domestic fans, mostly by foreign performers. But no one even suspected then that Djabe soon will leap forward, in the spirit of freedom. In the summer of 1998, the clip for the radio version of Djabe was made in Budapest, near Petneházy-rét. The script was written by László Nagy, director and director of photography, and by Attila Égerházi, and recorded on 35mm Kodak filmstock. Besides the band members also starred dance choreographer Gábor Bakó and his disciples. For the Djabe popularity, gave a hard push the bus clip, with an iconic, fully operational Icarus 66 type coach. 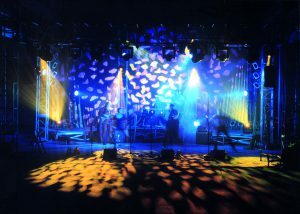 A real specialty was the Vari*Lite lighting equipment used for the outdoor night shoots.. The Witchi Tai To Tour of autumn, 1998 showed off this album with one of the most memorable and spectacular gig series of Hungary. This level of quality was not accustomed to in jazz and world music band stages before. Unparalleled audio quality, Vari*Lite lighting, dancers and the music left the fans completely charmed. The tour lasted till summer of 1999. 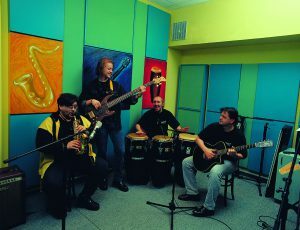 „The Djabe quartet gave an elemental gig of world music in Nyíregyháza. 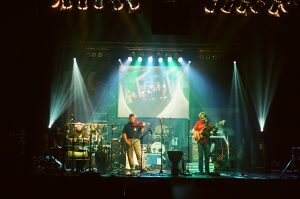 Obscured lights, thick smoke, a stage packed with exotic musical instruments – this is what lucky audience of 200 was welcomed by in the Móricz Zsigmond Theater. The quartet literally charmed this audience; this young band just released its especially high-quality double CD album Witchi Tai To, and this was the base for the one-and-a-half-hour-long show (because this was a show, not a gig!). The saxophone play of Muck, the virtuoso bass guitar play by Barabás also strengthen this statement. So, the audience sat there, in the gradually darkening auditorium, then suddenly four human-sized shadow stepped on stage just to fiddle with dong-like instruments – and then, a tropic rain started to pour! Like in Burma, in the middle of a rain forest. The sound effects were frighteningly authentic. And this is how it was, until the end of the concert. Visions After The Rain, Ode, Island, Camel Run, Desert I-III, Visions, Distant Dance. And of course, the showoff of exotic instruments also came true. The professionalism of Sipos, especially with the magic of Yoruba, was extraordinary. Soon after, when the quartet performed Javan folk music on wooden fregola-like instruments, well, the audience simply went crazy. This was a night, and a gig, to be remembered!” – said János Kállai, Kelet-Magyarország, 1998. Many versions of this song are known, but the Djabe version may be the most intense, sounding like a deep mantra, not just in Sipi’s vocal but in Tomi’s bass-plea. However, this intro is just one of the many sounds on this album. 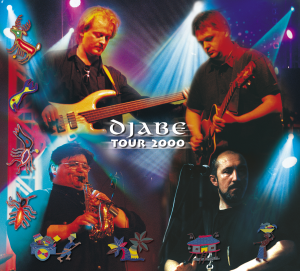 Back then Djabe was not touring international, but we can almost travel around the globe with help from the excellent photos and landscape-inspired music, from the Mayan pyramids to Indonesian islands. The head tour guide is Sipi, all the percussions came to life under his hands: hand drum and rainmaker, conga and djembe (called the king of drums by him). “African folk music come into view even more than before. Congas play 1000-year old rhythms: talking to the listener’s long forgotten basic instincts, awakening them. Sometimes it calls for a dance, sometimes it’s like a monologue: distant but understandable messages.” – said Sipi in Vasárnapi Hírek. In pieces Bali Waves, Wizard of Uxmal, Playground, Bali Trees he is the hero, while he completely owns Djolé. The latter is a part of a West-African ritual blessing newlyweds or abundant harvest. Then comes the collective angklung, which became a stage tradition for the band. Even a sound-check had been recorded, with Sipi and Tomi (Atti being the sound engineer, fortunately); we can hear they’re having fun, so can we. “Deep in the water or high in the sky – what’s the difference?” – the great question arise from the tranquil guitar Underwater Sunlight, and waiting for us inbetweeners to answer. Similar sounding color of pastel can be seen in Memory of Bells – there, the key was Sagrada Familia, as the music penetrates the building. Above The Skies is written by Attila to the memory of her mother; a chastely sad farewell on a simple nylon guitar, and a bit of Novus Jam-feeling, added by Judit Gesztelyi Nagy. AThis American critic of course could not know that with this release, Djabe just closed an era. The album was premiered on the Ly-O-Lay Ale Loya tour, in spring 2000. Multitrack recordings were made, the PeCsa performance in April was even recorded on video tape. This material was made into an album, released on CD, named Tour 2000. After Lay-O-Lay Ale Loya’s plastic case, Tour 2000 was housed in beautiful paper holder. Then, in the autumn they once again gone on national tour with this material, called Tour 2000. As before, all pieces got a separate and unique visual appearance, but the on-stage show changed compared to Witchi Tai To. Dancers were left out but built a mechanic canvas right in the middle of the background, sometimes descending and showing the audience cozy videos. Lighting is still based on Vari*Lite equipment, extended by these videos. The gigs played almost all Ly-O-Lay Ale Loya pieces and the first two album’s most important compositions, so all in all these performances were more than 2 hours of musical magic. Djabe’s epoch-making band update happened in 2001 by the need for further development. Ferenc Muck place was taken by two soloists, or more like 3 because Ferenc Kovács enriches the band both as a trumpet player and violinist, and Zoltán Kovács (Ko) not only provides new foundations but also classical and jazz-rock inspired and makes Djabe’s music richer with his own solos. The sounds of percussion also changed, as, besides András Sipos, a classic drummer was included in Szilárd Banai: never bothering but strengthening each other. As we could experience this in Santana, Osibisa, the Airforce of Ginger Baker or the Weather Report. 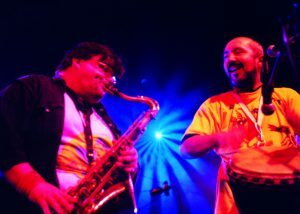 Englishman Ben Castle (saxophone) and Moroccan Saïd Tichiti (vocal, gembri, percussion) also heavily featured in many recordings and gigs. This was the first year for the band to include guest musicians at gigs. The change also included the cover design: on the torn apart, then rearranged photo shows Sipi, his left side painted as an African tribal member, his right side dressed as a modern Caucasian businessman. One side can’t live without the other, just as it is in Djabe’s music; however, Sipi is more like the left side. Our update begins with the sing of birds and tribal notes (Update is completed), then we take to the sky (Flying). I love to fly, I’ve done it over 100 times, and the ascension talks to me in music. With Flying, we reach travel altitude with Tomi’s tranquil theme, we unfasten our seat belts, accelerate to 900kmph which seems like standing still mid-air, only seeing ever-changing clouds and golden-reddish sunbeams. Meanwhile on the ground, Feri’s trumpet makes place for itself: first with a sordino, then it opens. And then, comes Ben’s saxophone. Oriental wise men say even the longest journey begins with the first step. I don’t know this is what was in the guy’s minds when composing First Step, but even this first step offers many-many directions. Lead Soldier incorporates a child-like naivitée with its 80s-sounding guitar and the following piano by Ko. Clouds Dance however, is a real evergreen of Djabe. It could even be the pair for Flying, but its scenery is lower, like a flock of seagulls soaring freely on the rhythm of Sipi and Szilu. Who can find the streams of Erdő, erdő at first listening? How can Spanish guitar, African and Turkish drums, Tibetan chimes and Hungarian folklore notes mix as a jazzy violin-piano cavalcade in only 5 minutes? Real bravado! Ben shows us two kinds of desire in Desire: a sensitive (bass clarinet) and a zealous (soprano saxophone). Tomi’s Fretless just dreams on. Mayombe is a Central-African religion of elder spirits and forces of nature. Mayombe sorcerers charm everyday objects (especially sticks and rods). Our sorcerer is Sipi, who plays an entire choir by himself, with Ben’s flute solo right behind him. Winter Forest is a beautiful piece of Atti’s lyre, with a guitar, a bass and a piano painting the silence of nature, while Ben provides life in the stillness. My Way, on the other hand, is filled by just Tomi and the Englishman. This saxophone-bass guitar duel feels intimate, almost confession-like, and the music rises questions for not just the musician but the audience, also. Barraguira shows free-virtues, with Ben responding with tenor-screams to the ‘ördöngös’ of Sipi, Szilu and Tomi. Colours is the private show of our drummer, a tasty funky-like impro summoning the atmosphere of the music of Mark King, Jaco Pastorius and Krzysztof Scieranski. Saïd also gets his chance with Ya Dellali, and right after everyone returns to update Witchi Tai To with Ben’s flute entry, and illustrating the septett’s harmony by sawn-together solos. “I think Djabe’s power lies in reaching so many music lovers. If you like jazz, you find jazz, if you like world music, you’ll get a great experience, if you like quality prog-rock, you’ll be astonished. And maybe, just maybe we help genres open up and be more transparent, encourage other projects and productions.” – said Attila at the beginning of Update Tour, in his interview with radio journalist János Neltz. “The musical world of Update builds upon the world music traditions of the band, while steps forward in instrumentalization and musical motifs. The audience can of course find all the exciting rhythmic and melodies incorporated by András Sipos, who was inspired by African and Arabic sources. 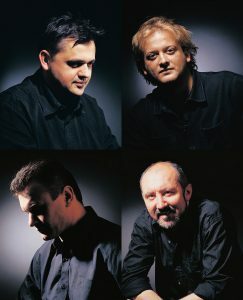 At the same time the soloists (Ben Castle, Ferenc Kovács and Tamás Barabás) also give quality performance, both music-wise and technique-wise. Tamás Barabás composed the content of this album from his and Attila Égerházi’s ideas. 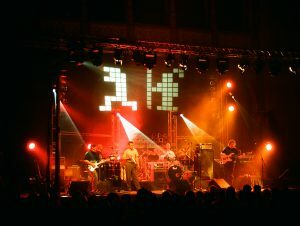 The audience can see and hear a musical (and stage) performance unique to the Hungarian music scene in both style and quality.” – written on Zene-net. Update was premiered with a grand tour of Hungary, in Summer 2001 to the end of 2002. The 6-member band was joined by Ban Castle. 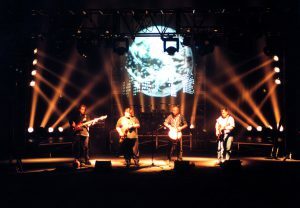 Stage technique remained the quality accustomed to Djabe: Vari*Lite luminaire helped carry on the visuality of the 2000 tour, but without projectors. Instead, 7 musicians filled the stage, upgrading the visual greatly. The more than 60-min first part was filled with older pieces, rearranged. 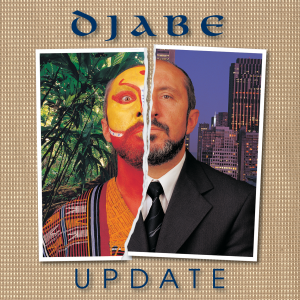 The second part premiered the complete material of Update, only excluding Saïd’s solo (he couldn’t make it to the tour and only re-joined Djabe on stage in 2002). 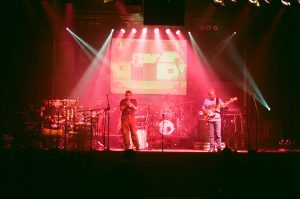 The gigs held at Petőfi Csarnok and Vigadó in Budapest was both recorded by the band. 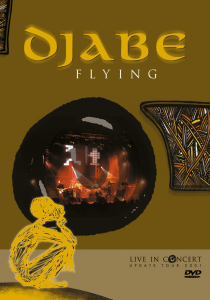 The best of this material made it to Djabe’s first DVD release, titled Flying. This was the first Hungarian jazz/world music DVD, and the first surround mix of Tamás Barabás. It sounds exceptionally good. 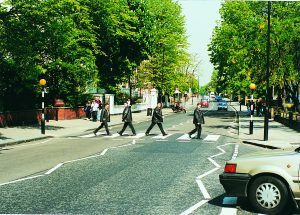 It even received praise from Abbey Road audio engineers in 2003, while working on Sheafes Are Dancing. A perfect audio-video footprint of the 2002 tour, this album succeeded abroad, too. “Flying – takes to the skies. Djabe – freedom. No other title could be given to this DVD. Once it plays, the flying begins… but where? Not a valid question. No borders, but why should we separate the world? 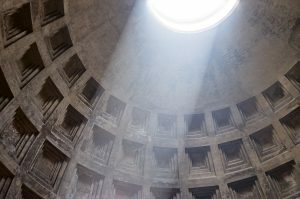 Modern civilizations and ancient worlds fit together perfectly, like a (possibly futuristic) dream. 133 minutes of tranquility… almost unbelievable! 7 different musicians, 7 personalities. Unique ideas, solutions, but always in harmony, inciting, inducing each other to achieve the very best. The only motivation is the love for their music. This is Djabe. And Djabe’s DVD is the best Hungarian release to this day. The whole disc is characterized by crystal-clear acoustic sounding. Perfectly understandable vocals, soft cymbals, the rattling of various little instruments. Dynamic bass, good transients. I am quite satisfied with the wind instruments, also. They have a naturally dirty sounding, because of the ‘wind’ part. Proportions and instrument harmony are perfect, well thought-out techniques and clear visionary is included. Because, if a music is unclear in terms of concept, the musicians cannot be in harmony, and no audio engineer can doctor that. I recommend to anyone who is open to the colourful world, anyone who wants to leave behind everything for 2 hours.” – said Attila Kiss, Digitális Házimozi, 2003. The making of the album ‘Sheafs are Dancing’ was inspired by the paintings of Imre Égerházi. In terms of editing method, one painting – one composition. Pieces are subscribed to Tamás Barabás and Attila Égerházi, with the addition of Ferenc Kovács and Zoltán Kovács in case of a few tracks. The album was the most successful release of the time by Djabe, and raised many heads in the professional scene across the world. It was the beginning of international success for the band. 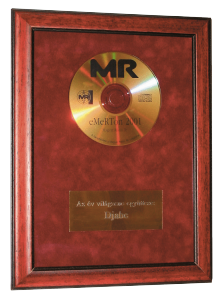 The album was nominated for MAHASZ Award in ‘best world music recording’ category in 2003. The disc itself is contained in a hard-case book of the paintings, hence the listener can enjoy the visual while playing the album. 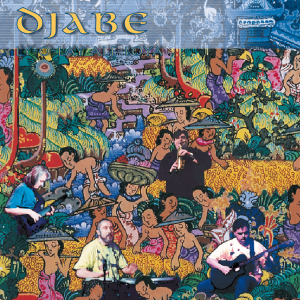 It was the first Djabe album to feature Steve Hackett, a beginning for many future releases and joint tours. His acceptance of Égerházi’s offer was more of a personal decision: Steve is quite fond of the art of painting, because of his father, and ex-wife. The next step was the release of the album’s new surround version where paintings could be enjoyed on the screen, too. This was the first DVD-Audio release of Djabe, and the first Hungarian release of this kind. The release was praised even by the audio engineers of Abbey Road where the auth oring process taken place. It even received a PRince Award for ‘best multimedia release’ – not without a reason as the visual content consisted of not only paintings, but nearly a 100 creations and documentary videos of Imre Égerházi, including an animation clip of his near-death experience-inspired work ‘Iceworld’ and 6 other paintings, connected to it. The base for this unique experience was the painter’s own near-death experiences, his interview can be listened to as an audio commentary for the aforementioned ani mation clip. Furthermore, a partial video of the album premiere tour and a road movie is also included on the disc. The extra content was praised even in Los Angeles, and nominated for Surround Music Award in ‘extra content’ category. 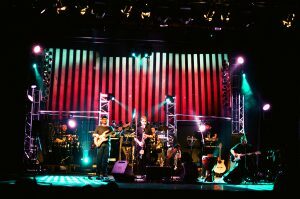 The multimedia experience was further developed along the premier tour, both video and audio wise. Music in surround not only existed in studio version but gigs were also presented in 5.1 sound. 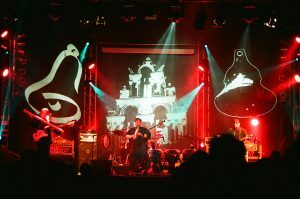 The band again returned to using background projections to show the title paintings, and other connecting creations and videos by Imre Égerházi which inspired the paintings. The gig started with a biography film about Imre Égerházi. This exemplary cross-art span was concluded in a gig at New Orleans Club, Budapest, Hungary in January 2004. The room next to the concert hall housed an exhibition of the paintings featured on the album. The visually augmented experience was followed by an unplugged version of the album. 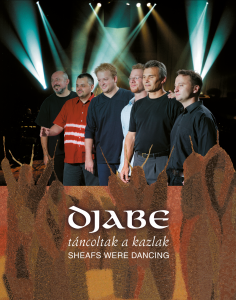 The 2-year long multimedia tour spawned the double-DVD album ‘Sheafs were dancing’, featuring multiple openings for Imre Égerházi expos, as Djabe performed regularly after 2004, the success of the unplugged concert. In 2016 the album was re-released with hard cover matching the original but featuring a double-CD format, with an extra concert disc. The release featured the title in English, an effect of the growing international success. The backbone of the content was the Tour 2003 Budapest material. 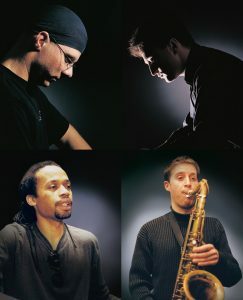 One of the videos is from 2004, featuring saxophonist Viktor Tóth as band member and was recorded in the New Orleans Club. The last recording on the disc shows the 2015 joint concert with the Miskolc Symphonic Orchestra, performing together in the Bartók Béla National Concert Hall of Müpa. Djabe’s longtime dream came through with the birth of symphonic versions of ‘Flying’ and ‘Iceworld’. Paintings of an exhibition – a cliché enough title, and we would already have made a mess of it all. Not just because it’s already taken in cases of music and fine arts. Think about the works Mussorgsky, Ravel, Emerson, Tomita, but more to the point: the example of the 19th Century. Mixture of music and painting resulted in the music being the one to remembered. A period inspired by Viktor Hartmann (1834-1873), majority of the paintings of his lost to us. The oeuvre of Imre Égerházi (1925-2001), however, is still with us, with the son of his as a faithful guardian, and Djabe’s music as a re-interpretation. For the loss of a father, ensuring his life’s work is the best remedy of all. Like continuing his paintings, but instead of a brush with the use of sounds, musical instruments – and as we are talking about Djabe, besides the catalogue book of the album, the visual experience at live gigs are also part of this mix. For one, they turned the standard of video clip making around and tailored the music to the visual. After composing the paintings are added to this finished musical experience, the linked associations, document movie parts. In Attila’s opinion, the presence of the artist does not overpower the band but added something to expand the music. The parallels between paintings and music are presented on a silver plate, with fine tinges and seemingly static movements. It can be said that the ‘Sheafs’ is one of our days’ most beautiful impressionist music. Imre Égerházi took at least a little from impressionist air. Even the title track of the album shows a finesse of harmony as sheaves are truly human. I first met with the Master almost a decade after my first listening to Djabe’s album. In 2014, an exhibition was held in the aula of the Ministry for Foreign Affairs. Titled ‘Over our borders in the eyes of Imre Égerházi’, I could experience some paintings I already listened to. Even if Imre Égerházi used multiple techniques, for me the feeling of Djabe music was presented by paintings (or the other way around, but whatever) where wood fiber and oil paint meets in a unique, granulous impression. Examples are the ‘Thiérachei emlék’ or one of the variations of ‘Lengyelország felett’ (as Miklós Radnóti said ‘For one who flies above, this land is merely a map’ – this motif surfaces often), and as feelings met in the music from Northern France and Pannonian Basin to the Balkan, these painted pilgrimages melting into one coherent whole. The ‘Fátyol mögött’ literally looking into the eye of the beholder, through giant eyes of a woman and windows in the background. This has a musical imprint on ‘Sheafs’: affable (through the trumpet of Feri) but keeping its secrets. As a great lover of Italy, the two paintings of ‘Olasz táj’ said great many things to me: one red with sun and the other of early autumn, just like I seen on the train blazing through Toscana one year earlier. The Bulgarian paintings talked to me almost in the same way: ‘Sumeni táj’ and ‘Naplement’ (titled ‘Alkony a tengerparton’ on the album) – these paintings, seemingly without any human presence, showed me sleeping, resting and watching figures. Imre Égerházi loved the music of Djabe, and painted often while listening to it. “Now we turned the angle of inspiration around, and started to compose, effected by his paintings.” – said Attila in an interview for Gramofon. “I was too surprised of Tomi’s almost Bartók-like sensitivity for musically representing the feeling of paintings like ‘Téli Hortobágy’ or ‘Szemrehányás’. We had a challenge composing for paintings of the Great Plains, Hortobágy and Transylvanian or Carpathian Ruthenian scenery, as previously we operated with African, Arab, Indonesian and South-American effects.” The numerous Hungarian motifs, presented mostly by Feri’s rustic baroque violin play, can be very well acquainted to an Indian tabla played by Péter Szalai and a soprano saxophone by Ben Castle in the ‘Hajdúböszörményi utcarész’ – for Djabe it’s not a contradiction. As Attila said, if it must be explained, this is a way to “summon the taragot”. But no explanation needed for the presence of Steve Hackett who sounds his guitars in ‘Thiérache-i emlék’. A member of the band Genesis, a musician often associated with Djabe, is a universal talent who quickly finds his place in any new environment. “Djabe made me display an extreme musical and emotional reaction, and I think this is the point. To give an emotional charge to music even touching not just the audience but the musicians, too, resulting in a cathartic experience.” – said the band leader about Steve. Even if the album was inspired by a sudden loss, it’s not about the grief but the beauty of a legacy left behind. As one of the most emotional piece, ‘Iceworld’, before which we can hear the Master as an opening, reflecting on his near-death experiences as a commentary for the painting ‘Repülés’: “As I arrived, there was only ice. In the foreground in a pile of ice, seemingly standing, some people, but not standing staticly but moving with their own space of ice… way back objects of unknown form growing out of recesses, alive… one eye closing, another opening… way more back buildings of unknown geometry I never seen before, I draw them multiple times to give back my experience… maybe to be solved one day.” These things, seen by Imre Égerházi half-way, not only spawned a vision of sound, intensive even with its own inner peace, of trumpet, acoustic guitar and bass guitar but a video clip to literally bring life to the lines of the blue painting. At the beginning and end of the movie, moments of the life of the Painter is sweeping through like in a photo album, like a dying man’s last breath. In a conversation titled ‘Musicians of an exhibition’, Feri said that the sorrow in the music is not real pain, but the experience of understanding, the urge of understanding deeper meaning. Tomi told that at a exhibition in Debrecen, when playing the video for ‘Iceworld’, a young man stepped to him and ask what is this about? After Tomi telling about the background of the origin the young man confessed he had near-death experiences too, and the video showed exactly how he felt. But we can’t just walk by such pieces like ‘Szemrehányás’ and ‘Beszélgetők’. The two woman on the first, probably a mother and daughter, are felt not only feeling reproach towards each other, but – while the violin talking back increasingly to the ostinato main theme – resistance till desperation. The other, originally titled ‘Utcarész’, has two characters barely visible, and Zoltán Kovács’s piano solo truly represents a stillness of air in a village where even the smallest of happenings is a thing of awe and be talked about. Father and son finally take each other’s hand in the album’s last piece, ‘Virágcsendélet’, composed for acoustic guitar. We now know that this was Attila’s first composition, bloomed in the art studio of his childhood. The main motif of daydreaming often reoccurs on guitar, as a bass solo and with the vocal of Judit Herczeg. A composition is completed, a life is completed, and everything goes on. Tomi, in the interview quoted, remembers that this work was needed to strengthen the connections between band members. “There are some moments in life when one becomes older, wiser and more experienced, and this was such a moment in the band’s life” – Attila added. “In Hungary, you can listen to music that is just like the Hungarian reality. It includes our material reality but as a cleaner version” – said Sipi. “The album is very well composed, the most complex work to day, and this made apparent that the emphasis will shift around the band according to the wishes of the music but I found my place just perfect” – he pointed out. “Stern and easy, intellectual music is played by this band, broadened to six members (their compositions sometimes so movie score-like we see pictures appearing on the horizon of our imagination). ‘Sheafs are dancing’ brings even more than the success before (Ly-O-lay Ale Loya, Witchi Tai To, Update). The freshest about it is a Gesamtkunstwerk experiment: this time the marriage of visual arts and music is explored” – wrote János Csontos in the journal Magyar Nemzet, about the album. “The idea is not unknown, but the choosing of the painter makes it so: Imre Égerházi (1925-2001) was unequivocally classified as the member of the Great Plains school of painters, and this cage – even if he was pushing the envelope – could not be broken until his death. He remained faithful to Hajdúság and Hortobágy while painting the Transylvanian hills and the seaside – true, a bit like snowy mountains looking down on the Great Church, or the sea billowing at the edge of Böszörmény. The painter, who tried fusing tradition and modernism, embraced a mystic side when painting his near-death experiences: these canvases hold more than clichés and things indescribable with words, reporting from the border that waits for all of us. 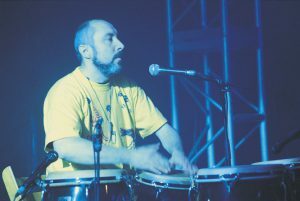 Attila Égerházi, one of the painter’s sons, is the band leader of Djabe. This album is in fact a salutation of a son before the legacy of a father. Luckily is not just visual art put to music: according to the catalogue of pictures of paintings included with the album is more of a re-imagining born by inspiration. ‘Beszélgetők’ and ‘Gyimesi hegyek’ are different kinds of successes; in the opus titled ‘Hóvihar’ an authentic folk-song can be heard behind the veil of music, and in ‘Iceworld’ Imre Égerházi’s monologue about the topography of his near-death experience is presented as a mental firmament besides the music. Everything is painted on a canvas so we must believe him. This (after) world is of tones grey, white and blue, its icemen and ice flora are alive and moving. Maybe we need to refuse the vision about a death described with warm colors?” Co-performance with a globally known celebrity (I would not like to call Steve a ‘pop-star’…) is a great testimonial for any band on the international waters. The movimentoprog.it, quoted earlier, starts with his critique about ‘Sheafs are dancing’ with an appreciation for Attila’s organization work of the Hackett-concert in Budapest, mentioning the agreement between Camino and Gramy about the distributing of the British musicians’ albums, and finally, the guest-starring of Steve on Djabe’s album. …The full-bodied rhythmic section of András Sipos and Szilárd Banai (the critic obviously was oblivious of the Hungarian meaning of the drummer’s name – the author) serves as a charming amalgam between the violin and the trumpet (Ferenc Kovács). 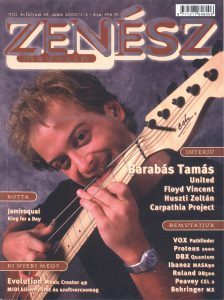 Jazz-tones are rich, thanks to Zoltán Kovács and the virtuoso bass player Tamás Barabás. Tamás’s sensual slap is often re-surfaces. Attila’s acoustic guitar embraces, Ben Caste’s enviable knowledge enrichens the music” – wrote the Italian critic, who called the ‘Triéache-i emlék’ by Steve “a luring bit of new age/soft rock”, the ‘Flying’ and ‘Iceworld’ a “ice-cold imagination between life and death”. The fusion of music and visual art, the sounds and visuals into one experience, a thing accustomed to Djabe before, paired with the guarding of the legacy of a father, resulting in a series of events and releases. 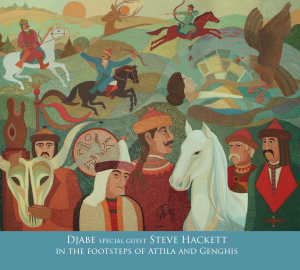 ‘Sheafs are dancing’ is a paramount for Djabe to day – or it would be, Attila warns, as Djabe has no paramount and possibly never will have one. They aspire not upwards but forward, on ever widening roads, often hiding rifts and traps, but nothing can compel them to turn back. In the meaning of the word, the band done everything that can be as a creative artistic community. “The material has been selected and edited with the utmost care. The visual fits perfectly into the music and sounding. Does not defer your attention, supplements the pieces well, or should we say, made one coherent whole with it. Seeing nowadays’ austere video clips this visual and audio effect almost means a dream come true…” – wrote a rapturous Attila Kiss in Stereo Magazine after the concert in Pecsa. This concert is in the core of the 2006 double DVD release ‘Sheafs were dancing’, on which we can all see the performance again, made whole by moving paintings and video recordings, and opens with a video portrait of Imre Égerházi from materials of interviews and a news report, and finishes with a Djabe best of show. Exceptionally interesting is the folk video d ocumentary complementing the painting ‘Gyimesi hegyek’, shot by Imre Égerházi and László János Nagy in 1972, at the first Csango Festival in Gyimes. Montage of ‘Szemrehányás’ also raises eyebrows, in which appears the artist’s village of birth, the rustic atmosphere of Hajdúhadház and Imre Égerházi’s mother and siblings. The backbone of the video was hand-picked by Attila from the 8mm material shot by László János Nagy introducing Imre Égerházi, in 1973. Other material mainly includes Super8 recordings shot by his father; these were used as visual background for the concerts. It was meant to help the audience understand the creations better, as the materials included were mainly shot at the place of inspiration for the paintings or while traveling. Imre Égerházi composed well not only on wood fiber canvas but with a camera, too. Projections show creations like the painting in question, expanding the horizons of the visual artistic theme. The Iceworld-clip, with a screenplay made by Attila from Imre Égerházi’s near-death experience, was made by the professional animation team of Focus-Fox Vide Studio based on the 9 paintings inspired by the master’s state of clinical death. A paramount for the performance was the perfectly timed live musical score. Permanence, tranquility, serenity, balance – these are the Artist’s professions of faith, these emotions must flow towards the audience and this is what is suggested by the complex pieces of ‘Sheafs’. 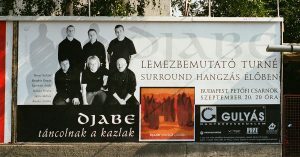 With this performance Djabe toured around Hungary and neighboring countries – emphasis put on live surround sound on the posters. A good representation for the tour’s spirit that in October, the Corso restaurant in Sopron even made a special, unique menu called ‘What Sheafs are dancing to’ in honor of the band. “Djabe consist of exceptional musicians, who are capable to create greatness in many styles. With sounding as colorful as our surrounding world. Without borders. While listening to it, the spirit and intellect can roam free. Be a painting or a rhythm thumped on an African drum, a sound on a piano, an accord of a guitar. 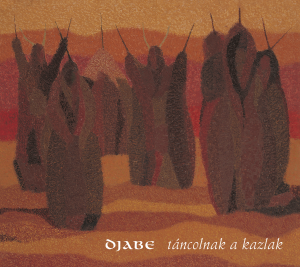 Djabe achieves what is one of their dedicated goal: the freedom of spirit” – written in Veszprém Megyei Napló. Sorry, this chapter is only available in hungarian. “Djabe plan to continue the work even harder in 2008. We’ll finish Take On. Official release date for the CD is the 18th of February. DVD-Audio with extras will be released on the 27th of March. With the new album a tour will commence in 2008, through Europe, North America and Asia. Djabe will continue as a quintet, as position of the irreplaceable András Sipos will not be filled” – stated by a press release of the band. Take On has the touch of András Sipos all over it, literally. All the percussion parts were played by him and vocals were recorded with only 3 exemptions. This unparalleled momentum surfaces in the opening Take On and later an amalgam of African rhythms, the violin of Öcsi and the tar of Malik Mansurov can be heard in Kilinama. This unison is quite peculiar: Steve is right to compare Malik to John McLaughlin. This duo makes the audience remember MacLaughlin and Jerry Goodman performing in the Mahavishnu Orchestra. Then And Now has something timeless about it, mostly because of the piano and the saxophone play of John Nugent. This is the first time of the American musician and manager of Rochester Festival as a guest star, who also introduced Djabe overseas. The same can be felt in Attila’s short, meditative solo, but the duo of Tomi and Szilu pauses the piece like a crossroad. The Latino-like Butterfly summons bands of the 60s, like Herb Alpert’s Tijuana Brass and Sergio Mendes’ Brasil ’66, in its main theme, as Feri knows even this kind of trumpet play method. At Night, nomen est omen, starts with a dreamlike trumpet but speeds up by Sipi, Tomi and Ko. Dreams can change rhythms, too, sometimes so disturbingly we even wake up from them! And another Latino-like, but different from the others: Los Sipos, a song to remember the Percussionist, played by himself. But even without him, this piece cannot be absent from the Djabe repertoire. Loose, easy, playful, dynamic and filled with joy – like the Sipi we remember. The album soon released in double side DVD, the video side sporting a 50-min recording of Sipi’s last gig, in Debrecen, Hungary at 7th of September, 2007. This makes the passing and the rite of remembrance complete. “Even after the tragic loss, Djabe is stronger then ever. A proof of this is the charity and memorial concert for Sipi, made real by the band and Steve Hackett. Or the freshness and power of the album Take On. The new CD is a worthy successor for the band’s traditions, the represented musical value of theirs. The composing skills of Tamás Barabás integrate the knowledge of all the band members, resulting a new level of quality. Compositions are fresh, unique but nonetheless familiar. World music from Hungary and Azerbaijan, with jazz by multiple approach. 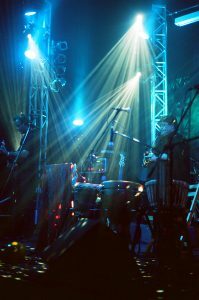 Gigs are for showing this in full for the audience” – a Djabe revival-review by hzo.hu site. Another fairly positive review was concluded by the Slovenian critic Rok Podgrajšek, giving 8/10 for Take On. 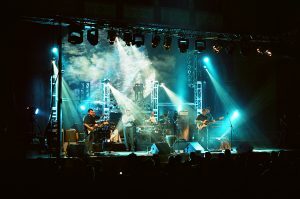 For Djabe 2010 started in Sarajevo, followed by Madrid and Thailand In August, the formation ‘Djabe special guest Steve Hackett’ started an Eastern Europe tour in Kaliningrad, Russia and Budapest, Hungary (the latter was the Djabe 15 extra gig). The tour continued in Debrecen and Pécs, Hungary, then travelled to Wien and Sofia and went to the Bansko Festival. After the Serbian Nisville Jazz Festival the tour ended in Belgrade. 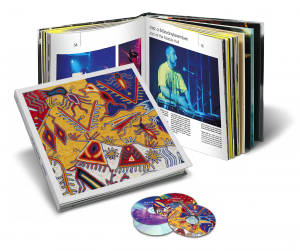 All the Hungarian gigs were recorded and released later on double CD; the first disc takes its material from the Debrecen show, the second from Pécs. Besides audio, concert video clips also made it to the discs: on the first a Serbian TV material from Nisville, the second shows portions of the Malaysian concert. Before the tour with Steve, in June 2010 the band went to Rochester, almost like a vacation. This was the 4th time John Nugent invited them, and they did 4 full-house gigs. Next stop Bucharest, the next Luxembourg City. Then another gig at the Romanian Garana Jazz Festival. On the latter gig and in Bucharest Áron Koós-Hutás played instead of Feri. In 2009 he substituted for Kovács on Crete and at two gigs on Slovenia, too. In September they went together to Brest, Belarus.